Two sessions on traditional rug hooking have been added to the fall course offerings for the Oak Hill Needle Arts School. These sessions will be offered on November 9th and November 16th from 11:oo a.m. – 2:00 p.m. The classes will take place in the upstairs parlor of the Chester Inn in Jonesborough. 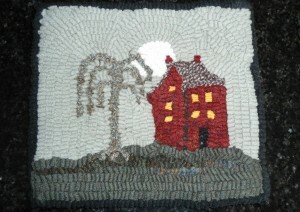 At the end of the sessions, students will have their own Salt Box House hooked rug to take with them. Hooking kits and materials are included in the cost ($35.00 for both sessions) of the class. To reserve your space, online casino please call the Heritage Alliance at 423.753.9580. The instructor of the course will be Joani Range-Douglas, hooked rug enthusiast. We hope you will join us. Come and learn or hone a skill as we work to keep these traditional arts thriving in Northeast Tennessee! For more information, please visit our calendar and events” page. This program is presented by the Watauga Association of Genealogists. For more information, please visit their website at http://www.wagsnetn.org/?p=1383. “Registration is now available for our upcoming workshop on Saturday, September 21, 2013. Visit our website for more information or print out the Registration Form and Flyer by clicking Printable Workshop Flyer. This program is not entertaining for young children. Oak Hill Needle Arts School will be preserving and passing on traditional needle arts, while presenting them in contemporary applications. Fall class offerings will include knitting, crocheting, and holiday ornament construction. Classes will be small in size (3-6 students per class), and meet for limited sessions, providing instruction from the most basic to more advanced skills and projects. The goal is to foster love for needle arts, by providing encouragement, fun and useful projects, and expert technical instruction. 50% of all class tuition will also help to support ongoing maintenance and programming at the Oak Hill School. Saturday classes are open to anyone 12 years of age or older, on a first-come, first-served basis, until each class is full. Pre-registration and payment of class tuition is required. All classes will take place in the historic Oak Hill Schoolhouse, with fall term classes starting on Saturday, November 2. In an effort to make traditional arts accessible to all, tuition will be at the basic rate of $10 per 90 minute session, half of which supports Oak Hill School. Deb Burger, founding teacher and Jonesborough resident, is a Heritage Alliance member, a Professional Member of the Crochet Guild of America, and a member of The Knitting Guild of America. She has published 2 books of crochet instruction and designs, and has over 20 years experience teaching various textile arts to all ages, casino online including several years at the John C. Campbell Folk School. The full schedule is available below. Individual class descriptions and supply lists can be found on our events” page. 11-12:30– Knit a Mini Mitten Ornament Workshop (1 session) Advanced beginner, must be able to cast on, knit, purl, bind off. “The Jonesborough Genealogical Society invites you to participate in their Early Settlers of Washington County Tennessee Project. We are compiling records on those who came to our area during the early years. The project will feature three important time periods; (pre) 1768 through 1777, 1778 through 1787, and 1788 through 1799 with an estimated 1,500 settlers in the area by 1800. Our intent is to publish a three volume set of books. Each book will explore the people, the places they settled, the politics of the day and other important information as can be found about each of the families. The first phase of the project will feature those who came prior to 1778. By our count, there are over 500 documented persons who were in the area by this time. We will also online casino highlight the fact that prior to settlement in the 1760’s the area was inhabited by the Cherokee and other important tribes. If you had ancestors who settled in our area prior to 1799 and would like to be included in any of the books, please contact us by email at : JGS1990@centurylink.net or by mail at Early Settlers of Washington County, Tennessee, Jonesborough Genealogical Society, 200 Sabin Drive, Jonesborough, Tennessee37659. Submissions are now being accepted. More information about how to submit your family’s history can be found on our website at www.jgstn.wordpress.com. Don’t despair if your ancestors came a little later. In addition to our Early Settlers of Washington County publications, we are offering an Early Settler Certificate program to everyone who had ancestors in the area prior to 1840 and can prove they are related to them. Details of this project can be found on our website at www.jgstn.wordpress.com/more-about-the-jgs/early-settler-of-washington-county-tennessee-certificates/. Come celebrate 100 years of the Washington County Courthouse on Saturday, August 10 and Sunday, August 11. Washington County is the oldest county in Tennessee, and the Courthouse has always played a pivotal role. The current Courthouse was built in 1912 and opened in 1913 to great fanfare. Washington County plans to honor this legacy 100 years later! Please join us for a fun-filled and family friendly weekend. Jonesborough Genealogical Society will host a workshop on family research at the Jonesborough/Washington casino online County Library. They will also be on hand to answer any questions you might have. 4:00 pm – 7:00 pm – Historic re-enactors, craftsmen (blacksmith, long rifle, Oldsmobiles, etc. ), tractors and more on Courthouse Square! 5:00 pm – Birthday cake and speeches in honor of the Courthouse. Telford Ruritan will be serving BBQ for $8.00 a plate. 7:00 pm – 9:00 pm – Free concert from country recording artist Trey Hensley and the Trey Hensley Band. 9:00 pm – Movies on Main presents Harry and the Hendersons. There will also be a Bigfoot Scavenger Hunt and maybe even a Sasquatch sighting. 2:00 pm – “The Home of the Brave,” a musical featuring over 100 voices in a combined choir from eight area churches, actors, instrumentalists, and dancers. Special tribute to 9/11. Directed by Cherry Smith. The event is sponsored by Johnson City Honda, with media sponsorship provided by the Herald & Tribune.